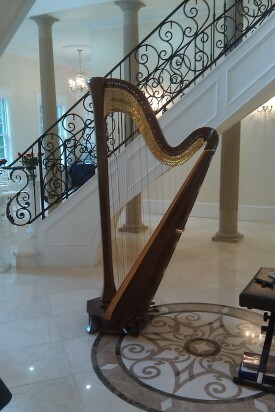 Recently, to offset any confusion, I answer the above question by saying “I’m a professional harpist specializing in wedding ceremonies and teaching. I also perform for a variety of personal and business events.” This tends to clear things up a whole lot better, and give people a better sense of what I do. While I used to frequently play in a variety of orchestras, and collaborate with church choirs from time to time, I have recently decided to put that type of work on hold for now while I raise my family. I still love orchestral music, but performing for weddings is where my passion is, and I am putting all of my energy into being the best wedding harpist Seattle has ever seen! This is my first serious attempt at blogging. 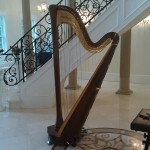 I hope to use this to introduce non-harpists to the world of a freelance harpist, and to give my colleagues around the globe encouragement as we go about perfecting our craft. I love my job so much, but it CAN be a bit isolating at times. My hope is that other harpists will read this on a practice break and know there is someone “out there” who can relate to them. I welcome comments, and hope that this becomes an interactive blog for clients, harpists, students, and wedding vendors alike. Bring it on! I just got the biggest compliment! A harpist in Dallas emailed me saying she has a bride who wants her to play “Flightless Bird…” just like my YouTube version, and where she can buy the music. That’s just amazing to me! Bittersweet smiles today as I remember dancing to “At Last” with my husband on our wedding day. 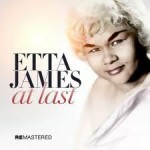 RIP Etta James.